Proudly Canadian since 1989. An ever-growing number of Canadians have been tasting the difference in our quality products. 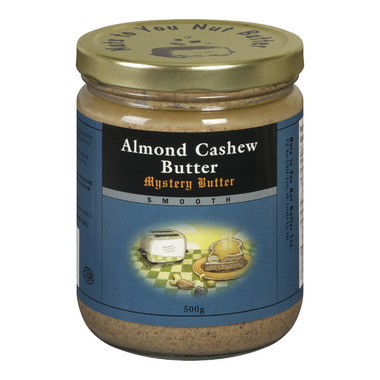 Ingredients: Dry-roasted almonds and cashews, sunflower oil. Worth every penny. The best brand of nut butters we've tried. We love the Mystery Butter on apple slices, but right out of the jar works too! Best brand for almond butter. Others are too oily or rubbery buthe this spreads well to the last scoop. Love this butter! I pour it Into a bowl first to mix in the oil, then back into the jar before putting it in the fridge. this is my favorite nut butter....absolutely delicious! Great stuff! A nice grown-up alternative to PB. I agree with the previous reviewers. I was pleasantly surprised at the taste and am recommending it to others. I am on a restricted diet and this fits in very nicely. Thank you for a great product. I second what Janelle said, this stuff makes peanut butter seem so bland. Recommend not refridgerating it though because it quite thick and harder to spread. Forget peanut butter ... this stuff is awesome!